Oden Corp PI1K Pro Fill 1000 Liquid Filler 05mL to 5 Liters Volume Fill . New Life Scientific, Inc. 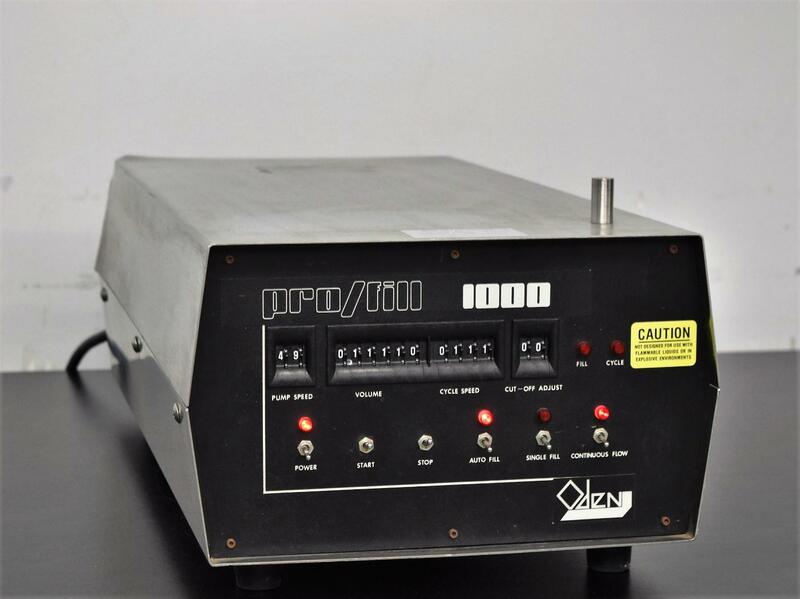 The Oden Pro Fill 1000 is a magnetic induction drive unit, which means that a clog will not burn up the motor or ruin the pump. This could be a major deciding factor for some industries or labs. This filler is a little older, as it was manufactured in October 1993, but it is still a good working unit. It is in good cosmetic condition with a dent in the upper corner. The technician straighten out as best as he could (which does not affect the function of the filler). Our technician disassembled to inspect the drive interface, the rotor and the pickup were in good condition. The control appears to work fine, the pumps remained on longer if a higher volume was set. Cycle time was tested and appears to work (how long the pump waits before starting the next pump cycle).